DDOT Anacostia Waterfront Initiative Program Manager Delmar Lytle addresses MWRTBA members. More than 50 members of the Metropolitan Washington Road & Transportation Builders Association (MWRTBA) were briefed Oct. 20 on two major, local transportation infrastructure projects during a breakfast at the ARTBA building in Washington, D.C. 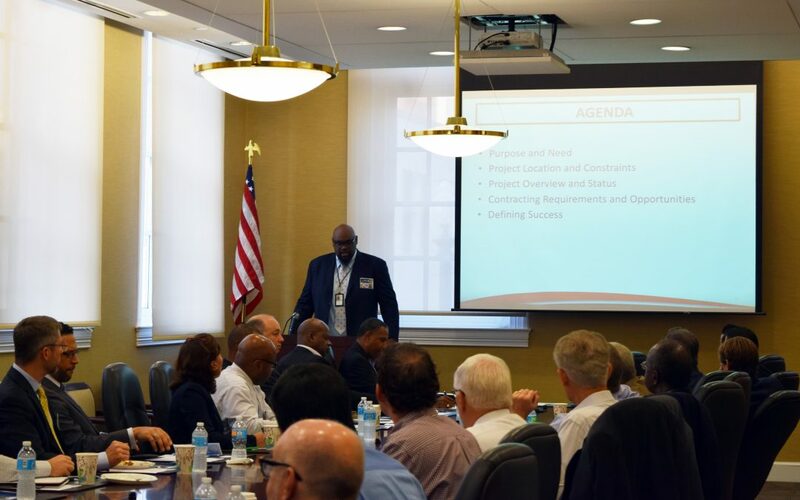 The group’s events provide networking and learning opportunities for transportation construction professionals in the District of Columbia and the Metropolitan Washington area. Delmar Lytle, program manager for the Anacostia Waterfront Initiative (AWI), provided an update on the South Capitol Street Corridor Project, a major part of the $10 billion infrastructure initiative transforming the shores of the Anacostia River in Southeast D.C. The first phase of the project, budgeted at $662 million, includes replacing the Frederick Douglass Memorial Bridge, construction of the surrounding streets into a scenic boulevard, improved safety for pedestrians, cyclists, transit riders and motorists, and accommodating up to 70,0000 people in the area once a new soccer stadium is built, Lytle said. The selection of the design/build contract is expected soon, with construction expected to begin in summer of 2017. The project has an estimated completion date of the end of 2020 or early 2021. More information on the project is available on the District Department of Transportation’s (DDOT) website. William Sharp, procurement manager in the Office of Contracting and Procurement at DDOT, shared an update on the I-295/Malcom X Avenue Interchange Improvement Project, which will provide directional ramps to and from I-295 that facilitate full access to Malcolm X Avenue and the new Department of Homeland Security access road. A 10-foot wide shared use path will be built for pedestrians and bicyclists. DDOT is expected to implement the more than $100 million project upon design completion in January 2017, with project letting in spring 2017 and completion in mid-2020, Sharp told attendees. Contact MWRTBA Executive Director Mike Sakata or visit www.mwrtba.org to find out more, including information on the Dec. 16 annual holiday party.